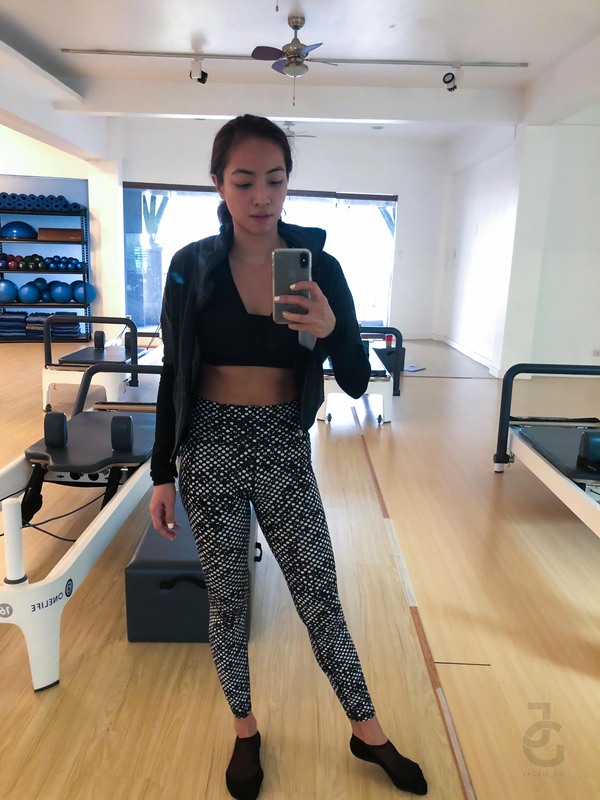 Active Wear Diaries: Tell Me I’m Not The Only One? I have a confession to make: 1/3 of my closet is made up of active wear yet roughly only 20% is being used on heavy rotation. But let’s face it. We all have favourites especially when it comes to our clothes. Some just fit more better than others so we really tend to use it over and over again. I swear no matter how much I try to rotate my active wear, I always end up going for my favourites. You’ve probably seen me wear this bra top and leggings one too many times! Same bra top, different leggings. Nothing wrong with repeating clothes. And if you’ve got a favorite and it makes you feel good wearing it, go buy it in all colors possible! YAS! But to be fair naman, I try to wear prints and other colors too! Though majority of my activewear is really black, white or grey. I like wearing these colors coz I know I can wear it over and over again and I won’t be too madungis (dirty) looking whenever I’m at the gym all sweaty! One of the things I’ll try this year is to wear more colors & styles while working out. I swear I love motivating myself with cute gym clothes! It gives me that burst of energy I need especially when I get too lazy to workout. See! My Monday blues outfit last week where I was literally wearing blue and prints too! Sometimes my son even notices how I wear the same pieces over and over again. Not only that he even asked me if I do get sweaty at all. Though my kids know I don’t break a sweat easily, he still wonders how I don’t smell sweaty even if I’ve already broken a sweat! Here we are minutes after we were done working out at home. He clings to me like I’m fresh from the shower. I don’t know if he’s been sweet or what but I’m glad he thinks my workout clothes still smell fresh! 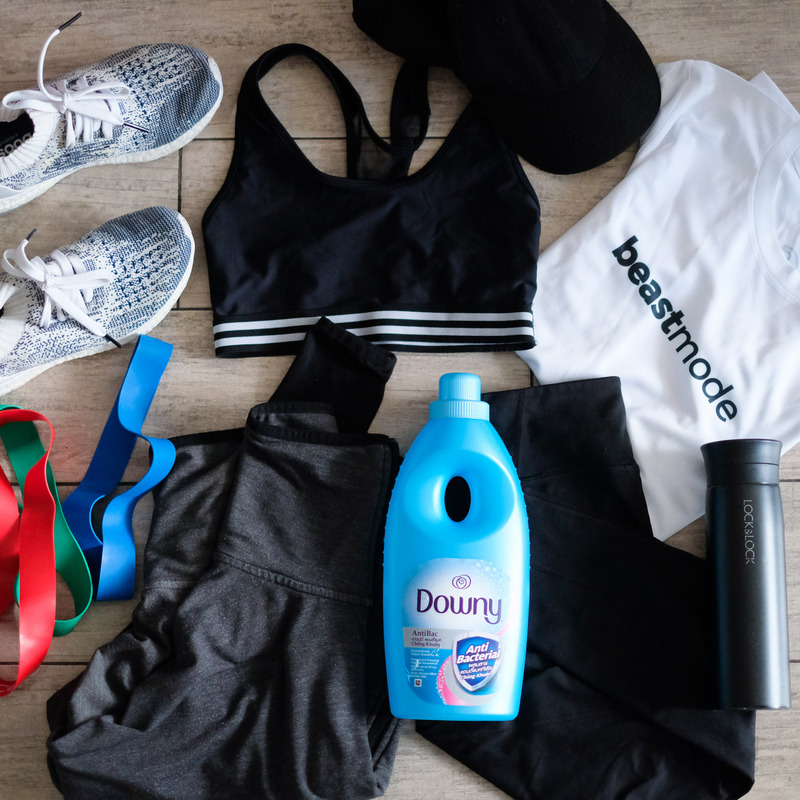 Some of my workout must haves include my favorite jacket, tights, bra top, rubber shoes, water tumbler, resistance bands and Downy AntiBac. When I was young my mom has taught my sisters and I how to do the laundry at an early age. I think I was in Grade 6 when I started doing the laundry. My mom would always remind me to put Downy on the last rinse otherwise I’d end up (and my sisters) wearing our stiff and faded clothes. Since then Downy has stuck to me as a NEED & a MUST when it comes to washing clothes. Over the years it hasn’t changed & Downy has been an essential product in our household. While I do like the basic variant–Sunrise Fresh, I also use different variants depending on what clothes I wash. Baby Gentle for our kids’ clothes when they were babies, Passion for Mr. JG & my clothes–because of the sophisticated smell it gives our clothes), AntiBac for our kids’ uniform, towels, and my active wear clothes–because it’s proven to kill 99% of germs that causes malodour on clothes. What’s more yucky than wearing not properly washed clothes? (that di na banlwan mabuti smell is just gross!) well wearing your activewear and smelling super sweaty like your clothes weren’t washed properly. Technically I think they are equally yucky. Which is why I highly recommend using Downy AntiBac on your active wear clothes (even on your child’s PE uniform). Not only does it help retain the vibrancy and softens the fibers of your clothes, it also prevents germs that causes that amoy baho smell. More often than not if we go to the same gym, you’d find me wearing this jacket at least twice in a week! Because I love to laundry our clothes right away. I don’t want to leave them in the hamper for so long because even if they’re not wet from sweat, dirt and bacteria from dirty clothes can spread so it’s better to clean them as soon as you can. Pretty much confident to wear my active wear favourites simply because I know it’s clean and fresh. I’m also quite confident to break a really good sweat when I workout (I feel really accomplished whenever I sweat a lot, it means I had a good workout!). 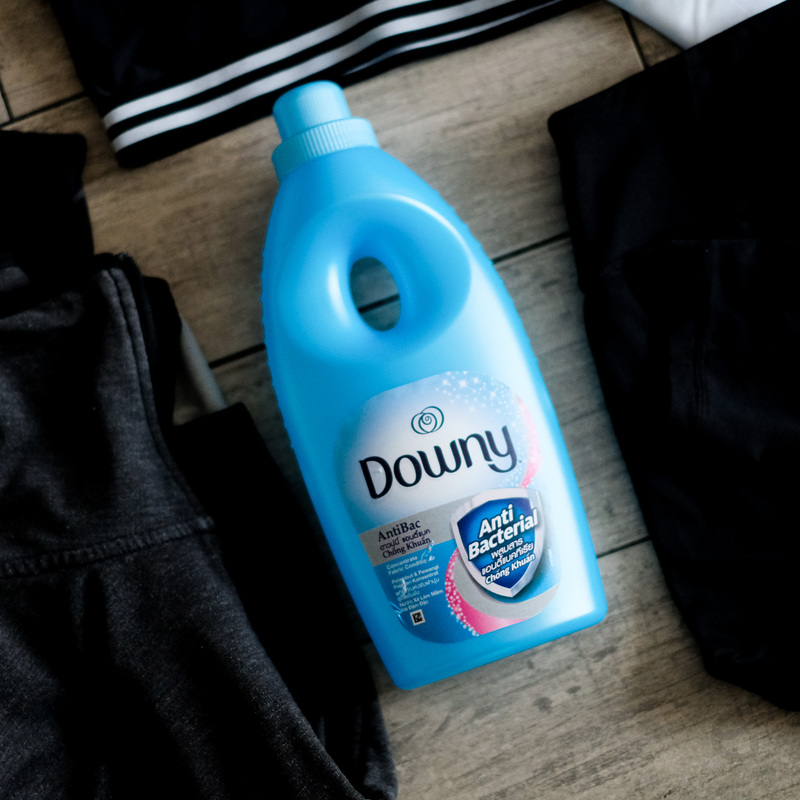 No matter how much sweaty I am at the gym, I still feel & smell fresh because I use Downy AntiBac. Don’t be afraid to break a sweat and be active! Go ahead and workout and let Downy AntiBac keep you fresh while pursuing your goal to a fitter and better you!